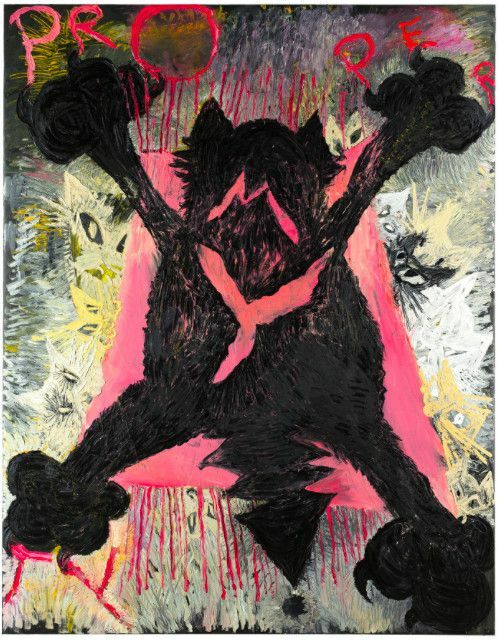 For his fourth solo exhibition at the gallery, SANKT RUFUS, Harms has created a series of paintings as a monument to the late cat Rufus. Rufus’ relationship to this farm was and is enormous: he lived there for 18 years—human years—85 cat-years. He knew each culm of each field, each brick of each building, the creek and the edge of the forest and each hole of each mouse. The relationship to Rufus was and is atomic...he guided us. He lived on the farm a whole winter alone, sovereign and happy, only fed by a neighbor and himself. Each salutation with us into the sunny courtyard was a big fest: “Damned – where were you??? !” In the end, we bought this farm because of the cat: Rufus the decision-maker. “Beziehung haben“ - having a Krupp-Steel-Relationship to someone or something. To me this is the main aspect necessary for creating art, especially when you are a German Contentist. This black dot in the green fields was so magnetic that he must appear on the canvases as a black dot too. Huge, small, scratched or thick spackled with an ultra-thin and round palette-knife—Rufus is a storytelling prototype—he determines the big WHAT (to paint) and the big HOW (to paint). His orders get even more precise and my right arm becomes a machine…….spackle, spackle, spackle, spackle…….and suddenly – almost automatically—the KING OF CONCRETE appears onto the canvas: SANKT RUFUS!